The ‘ba ba ba’ ‘ma ma’ and ‘da da da’ that a baby utters as an infant may not make much sense to parents but it is increasingly being understood as an important tool in predicting the cognitive and social development of the baby, says expert Dr. Perry Klass. As a paediatrician Dr. Klass always believes in asking parents about the babble of their kids at four months, six months or nine months. These help find out if the baby is babbling normally or if something is interrupting this development. The reason for not enough baby sounds could be that the baby is not hearing properly, is not processing the words or that not much is being said to him. Babble is an essential precursor to speech and scientists have noticed that babies from all over the world babble in a similar way. It is only after they are two years old that they shape the sounds of their words into the native language. According to Dr. D. Kimbrough Oller a professor of audiology at University of Memphis, the sounds babies make in the first six months of life are the foundation of later languages. The squealing and growling at this age helps develop social interaction and play with the parent. But he said that these are not formed syllables. 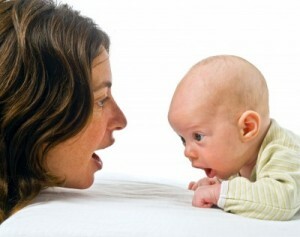 “By the time you get past six months of age, babies begin to produce canonical babbling, well-formed syllables. Parents do not treat those earlier sounds as words; when canonical syllables appear, parents realise the syllables as negotiable.” said Dr. Oller. After six months babies should start using more of consonants and vowels in the words they say and if they are not doing that and still doing just aaa and ooo, the baby is not practicing the sounds to word formation. The doctor says that by this age the mouth muscle of the infant needs practicing for the next level i.e. the language to emerge. He adds that is babies are saying words like ba ba instead of guessing what he wants, parents should say specific words like apple or bottle to help their child learn the words.